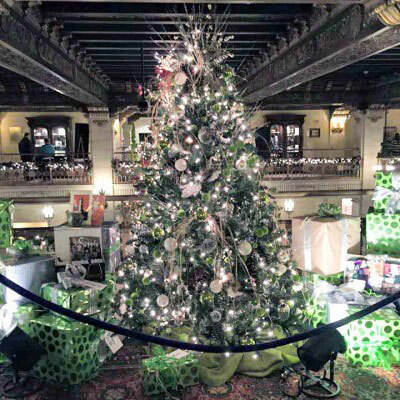 This year's holiday display at the Campbell House in Browne's Addition runs from this Saturday, December 19 through Saturday, January 2 on selected days (December 19, 20, 23, 24, 26, 27, 30, 31, January 1 and 2). Hours are 12 noon to 4 pm, except December 24, when doors close at 3 pm. The Campbell House will be decorated for Christmas and open for visitors to explore the house at their own pace as there are no formal tours this year. There will be an activity, a craft, and four living history interpreters on all of the dates listed above. 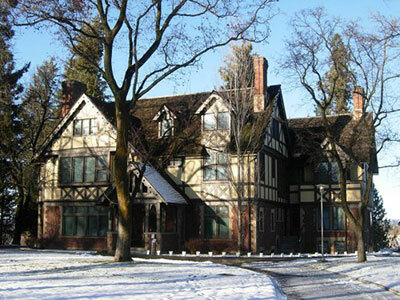 Admission to the museum includes the Campbell House. The LEGO sculpture exhibit, Nature Connects: LEGO Brick Sculptures continues through February 7. The Spokane Symphony's Holiday Pops concert is this Saturday, December 19 at 8pm and Sunday, December 20 at 3pm at the Martin Woldson Theater at the Fox. This year's concert is full of holiday tradition with some new surprises, all performed by the Spokane Symphony, the Spokane Symphony Chorale and the Spokane Area Youth Choirs. Special guest performer is vocalist Abbey Crawford. This is the first holiday concert led by Assistant Conductor Jorge Luis Uzcategui and he's included some of his personal favorites into the program. Ticket prices and information are available are www.spokanesymphony.org and www.ticketswest.com or 800-325-SEAT. In the last Fireside concert of December, Arbor Crest's musical guest performer is Evan Denlinger this Thursday, December 17 and on Friday, December 18, Bill Bozly is back by popular demand. Music runs from 5:30-7:30pm and the wine bar/tasting room is open from 5-8pm. Arbor Crest is planning on continuing their Fireside Music series in January, details to come. The Trackside Studio at 115 S. Adams, is having a special opening this Saturday, December 19 from noon to 4 for their 'Ode to Bowls' exhibit. Have a cup of holiday cheer and find a beautiful bowl for a unique and special gift. Get more info and see the show online at tracksidestudio.net. 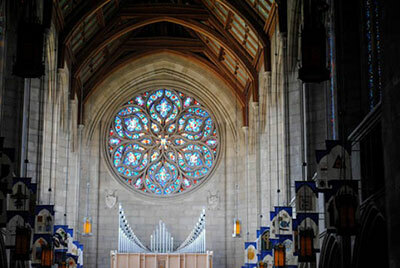 The traditional Anglican Service of Nine Lessons and Carols will be presented on Friday, December 18, 7 pm at the Cathedral of St John the Evangelist. The Anglican tradition of Nine Lessons & Carols, synonymous with King's College Cambridge's annual Christmas broadcast, includes carols, anthems and readings of the prophecies foretelling the coming of Christ. The concert runs from 7-8 pm. Chances are someone on your list would love these tickets for Christmas. 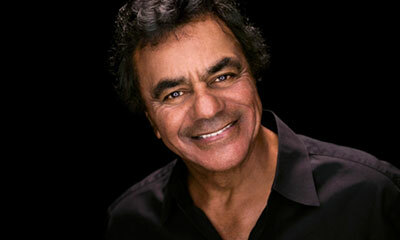 Legendary singer Johnny Mathis will perform some of his greatest hits and personal favorites at the INB Performing Arts Center on Sunday, April 24 Contact Ticketswest at www.ticketswest.com or 800-325-SEAT. Join Coeur d'Alene Casino Resort and Hotel for a cultural experience unlike any other at the first ever Authentic Native American Lighting Show, running every Friday and Saturday through January 2. A new event exclusive to Coeur d'Alene Casino, the Authentic Native American Lighting Show will expose visitors to a stunning visual and oral history of the Coeur d'Alene Tribe's winter activities and traditions. Guests will experience a modern interpretation of a traditional native encampment complete with winter lodging, food, and activities featuring more than 15,000 lights adorning 22 Teepees and 55 animals as cultural director Quanah Matheson tells the story of the tribe's winter traditions. The guided 30-minute bus tour will be available every thirty minutes. Complimentary tickets can be picked up at the Casino Box Office. For more information, visit www.cdacasino.com or call 1-800-523-2464. 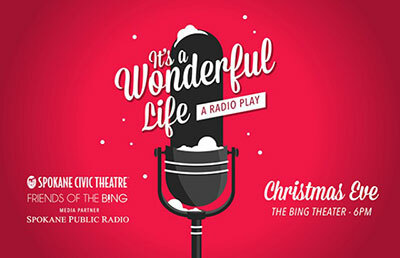 A radio play showcasing the perennial holiday classic 'It's a Wonderful Life' will be performed on the stage and broadcast from the Bing Theater at 6 pm on Christmas Eve. This unique way to experience the beloved story of George Bailey's journey from hopelessness to peace during a very long and magical Christmas Eve is a joint production of the Friends Of the Bing and Spokane Civic Theatre. A five member cast from Spokane Civic Theatre will do double duty as they bring the teeming world of Bedford Falls to life on stage while they also play actors putting on a radio play, in Joe Landry's clever mash up of depression era radio and the beloved Frank Capra film. Ticketswest has your seats at www.ticketswest.com or 800-325-SEAT. 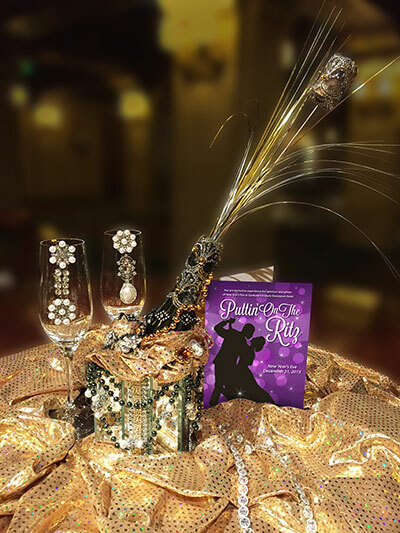 Here's the perfect gift for the theater lover in your life! Season tickets for Coeur d'Alene Summer Theatre's 2016 season are available now. With shows like the Tony Award-winning 'Peter and the Starcatcher,' 'The Music Man' and 'Disney's The Little Mermaid,' you're sure to please every age! The deadline for season tickets is February 6, 2016. Call 208-660-2958 or visit www.cdasummertheatre.com.